Hightex® Dynamic See Thru shutters or perforated shutters are designed to provide security to residential as well as commercial areas. 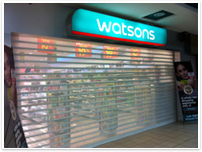 See thru roller shutters enable transparency as well as ventilation to the shop front. 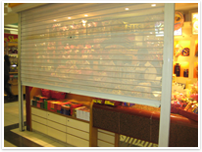 It is an ideal method of securing premises whilst maintaining the inner shop visibility when the shop is backlit. The standard thickness for see thru slat is 0.7mm. These slats are made from high tensile material with added pin holes for ventilation and viewing. The furnishing coat of see thru shutter is powder coat. Hightex® Dynamic has its standard powder coat, chart. Special colours can be requested with an additional fee. 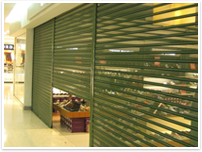 The maximum size of see thru shutter is 12,000mm(width) x 5,000mm(height). The motor can be single phase or 3 phase. For motorized function, remote control and back up battery can be added. To economise, the shutters can be manually operated and divided in a number of panels using a center mullion. For manual shutter, the maximum size for single panel is 3,600mm(w) x 3,000mm(h). See thru slats can be added in between the solid slats. 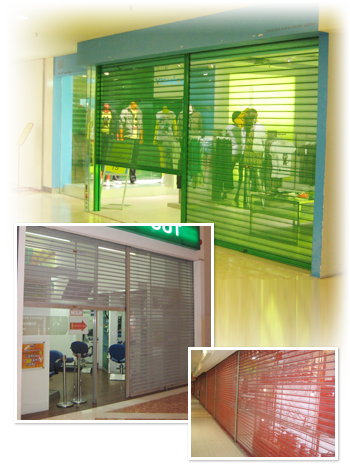 The combination of solid steel slats with few pieces of perforated slats assured security while offering marginal inner shop visibility in the cost effective manner.